Why did the Kestrel price come down? We made a change to the buckle hardware on the leg straps. Some of the best life-safety buckles in the world are manufactured by ISC in Wales. We originally chose them for the Kestrel because they are convenient and easy to operate with just a click, allowing you to quickly open and fasten the waist belt and leg straps. This season we learned the ISC leg strap buckles will be delayed until September. Rather than have Kestrel delayed that long as well, we are now using frame buckles on the legs. They are just as safe, in good supply, lighter in weight and bulk, and significantly less costly. They are, however, a pass-through style that is slower to operate. Kestrel leg straps will now be fitted with the frame buckles as standard equipment. If you prefer the ISC buckles, you can order your Kestrel with them for $26 more and a long wait for delivery. This upgrade option will appear in our online store soon. Does a rope bridge come with my Aero Hunter saddle, or do I have to purchase it separately? Yes. The rope bridge is an essential part of any Aero Hunter saddle. Every saddle comes with the bridge already installed. What size Aero Hunter should I get? Should I choose the larger size Aero saddle to fit over my bulky winter clothes? If your size fluctuates around 36″-37″, choose Size 2. This is usually the best choice for people in the middle. If you find that size 2 is too large, you can return it to exchange for size 1. We can accept the return within 30 days if your original Aero Hunter saddle is in the same new condition as when you received it. How is it to wear the Aero Hunter saddle while walking in to my hunting site? The Aero Hunter saddle is great to walk in.The Aero Hunter seat conforms to your body and moves with you. You can put on the saddle, tuck the rope bridge and lineman’s belt aside, and hike through the roughest terrain or brush as if you wore no saddle at all. Can I buy just an Aero Hunter saddle, and use it with the linemans belt and tree strap I already have? Yes. See Aero Hunter Tree Saddles. How do I climb the tree using Aero Hunter? The Aero system does not include any method or device that gives you a foothold on the trunk for climbing the tree, BUT YOU WILL NEED ONE. You will also want a way to create a small platform or foot rest when you reach hunting height. There are many products available (climbing sticks, screw-in/strap-on tree steps, etc.). We are proud to recommend the SteppLadder from Wild Edge as the perfect companion to Aero Hunter saddles. 1. Install the first few steps on the tree trunk, up to the height you can reach from the ground. 2. Set up the lineman’s belt. It is securely tied to the right side D on your Aero saddle. Throw the free end of the lineman’s belt around the trunk and catch it in your other hand. Clip it securely to the side D on that side. Check that all connections are secure for life safety. 3. Step up onto your first climbing step, leaning back to put tension on the lineman’s belt. Every two or three steps, lean forward to slack the belt, then flip it higher to keep pace with your ascent. Add steps as needed, as you go up. Adjust the length of the lineman’s belt to keep the right distance from the trunk as the trunk diameter grows smaller. Repeat until you arrive at your chosen hunting height. 4. Switch your life-safety support from the lineman’s belt to the tree strap according to instructions in your Aero Hunter User Guide. 5. Now you will want to set up a small platform where you can rest your feet or stand during your hunt. Some kinds of tree steps or sticks will work for this, or you might prefer a specialized product. 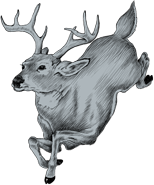 Your hunting supplier will have more information about products you can choose. 6. To descend, reverse the process. Attach your lineman’s belt as described above, then switch your life-safety support from the tree strap to the lineman’s belt. Remove the tree strap. To descend, lower the lineman’s belt first, then step down, and repeat until you reach the ground. SPECIAL NOTE: Hunters who are skilled at rope-and-saddle tree climbing have used that technique instead of footholds on the trunk. They carry about 50 feet of rope and a small throwline and weight for setting the rope in the tree. First the rope is anchored to the tree, then the hunter climbs it using specialized friction knots. Safety is assured from the moment you leave the ground. Descent is also quicker and safer using a climbing rope instead of tree steps. Climbing this way, the hunter does not need to carry climbing steps, or a lineman’s belt. And the hunting tree can be rigged in advance with a pilot line to pull up the climbing rope, making tree entry fast and quiet. For more information about tree climbing, see Books and Videos in our store, and a variety of tree climbing resource links here. Can I use the Aero Hunter saddle as the safety harness in my tree stand? No. With a tree stand, safety requires a full body harness to catch a fall. A lanyard attached to the tree connects to the back of a full body harness, with no load until you fall from the stand. When your weight loads the harness in a fall, you are suspended from your back at about shoulder level, so you dangle vertically. This provides the least chance of spine or internal injury during a fall, although by no means does it guarantee 100% safety. The Aero Hunter saddle is a seat harness, not a full-body harness. It is used to prevent a fall, not to catch one. In a seat harness, your body is supported by rope under tension the whole time you are attached to your tree strap. You set your tree strap or tether overhead on the tree and hang from it directly. That way, there is no slack in the strap to fall into–thus, no fall. You cannot fall, because your weight is constantly supported by your safety system no matter how you move about. This is unlike in a tree stand, where your safety strap is slack until you go off balance, fall, and your full-body harness catches you. We do not recommend using Aero Hunter saddles, or any seat harness, in place of a full body harness in a tree stand. Because you face away from the tree, and the safety connection is in front of you, your lanyard cannot be as taut as it should be to minimize a shock load. Also, having a lower suspension point could lead to strain on your back in a fall. Always remember that Aero Hunter and all seat harnesses are used to prevent, not catch, a fall. They are not appropriate to replace the full body harness in your tree stand. What is suspension trauma and is it a risk with Aero Hunter saddles? Aero Hunter saddles are seat harnesses that distribute your weight between waist, back and thighs. They allow free movement at all times while hanging in the saddle. Properly fitted, they do not inhibit blood circulation and do not lead to suspension trauma. Not so with full-body harnesses. When your body is suspended in a full-body harness, the leg straps compress the femoral veins at the groin. This causes blood to pool in the legs rather than return to heart, lungs and brain. These organs become oxygen deprived and start to fail within minutes. You can lose consciousness, and your heart can stop. Meanwhile, the pooled blood in the legs becomes acidic with waste products, which is toxic to the heart once the pressure is relieved and blood flows again. Suspension trauma can be lethal. The simplest way to prevent injury from suspension trauma is to bicycle your legs to keep the blood moving until you can get out of the harness. There are temporary relief straps on the market, also. The straps are like stirrups that allow the victim to stand up to relieve pressure on the groin. See a poster that illustrates what happens with suspension trauma. Tree Climbing With Spurs: Yes or No? Where can I see Aero Hunter before I decide to buy it? I both hunt and climb trees. Is there one saddle that works for both?